When your youngest child reaches the height of 42", take the family to Disneyland. Save up, because it is going to be expensive. How expensive? 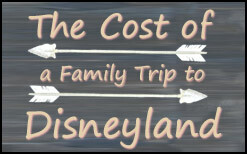 Well, if you are like me, and drive your family of four from Sacramento and stay for three days, it is going to cost $1,844. Approximately. Nick and Alisha joined us on our trip, and it was pretty much the ideal family getaway. Before we left, we secured a room at Staybridge Suites in Anaheim, close to the park: $510 for four nights. 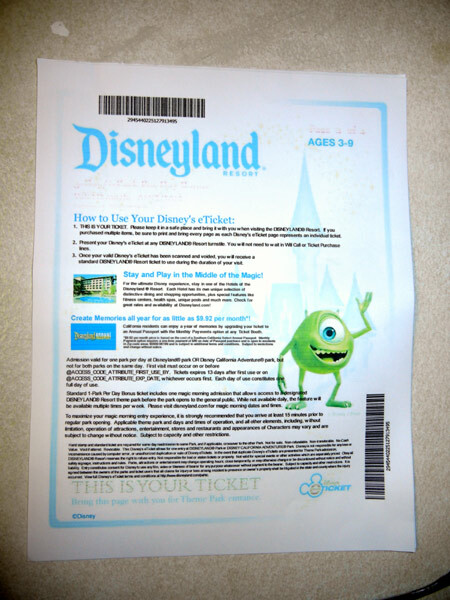 We also bought tickets for three days at Disneyland. Three day tickets are pretty much the minimum stay where you actually save money on park tickets. 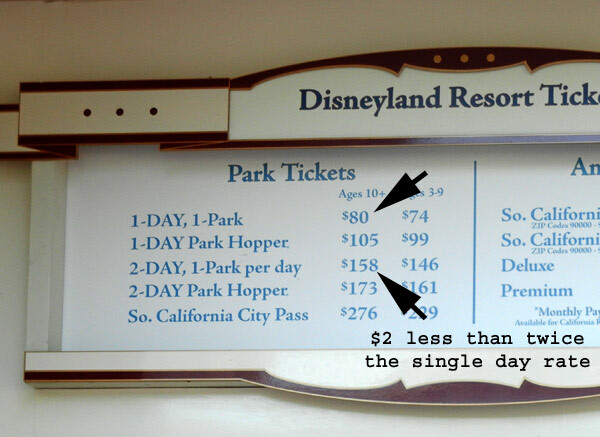 In 2011, tickets to Disneyland cost $80. For a two day ticket, you add $78 and pay $158. For three days, you add $41 and pay $199. After three days, adding additional days gets really cheap. The fourth day is just $20 more, the fifth day is another $11. The sixth day is $5! Kid tickets are a little less. We paid (2 x $199 + 2 x $183) $764 total four four tickets (no sales tax). Three days sounded like a luxurious stay to Stacy and I. Neither of us had ever been to Disneyland for more than one full day. 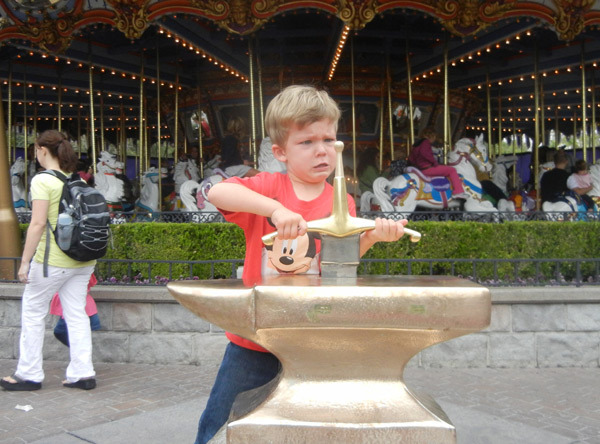 We figured we could spend two days in Disneyland and one day in The other Disneyland - California Adventure. Our trip begin on a Wednesday. We picked June up early from school and brought her home "to run errands". We sat her down and surprised her and Ferris with news of the trip, which was starting immediately. 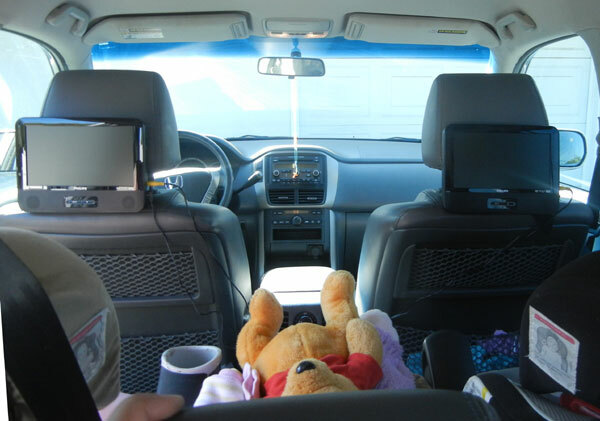 To help withstand the six-hour trip, we bought a dual DVD player package for the car. They were $166. We rented $1 DVDs at the Redbox, intending to return them in Anaheim. Initially the kids were more excited about the DVD players in the car than they were about Disneyland. Just out of Sacramento, we stopped for coffee and gas. We paid $47 for the 12 gallons it would take to get us the 400 miles to Orange County, California. 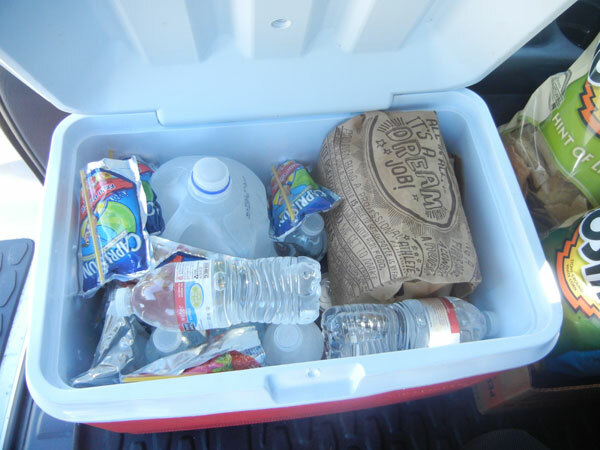 We packed a lunch for the road, and a box of snacks and easy food for the hotel room. Disneyland doesn't let you bring food into the parks, or I would have packed an entire shopping cart. I considered keeping track of every cent we spent on the trip, but I'll spare you from that level of detail for now. After about seven hours on the road, we checked into our hotel, a few blocks from Disneyland. The suite had two distinct rooms, including a fridge and a tiny stove. 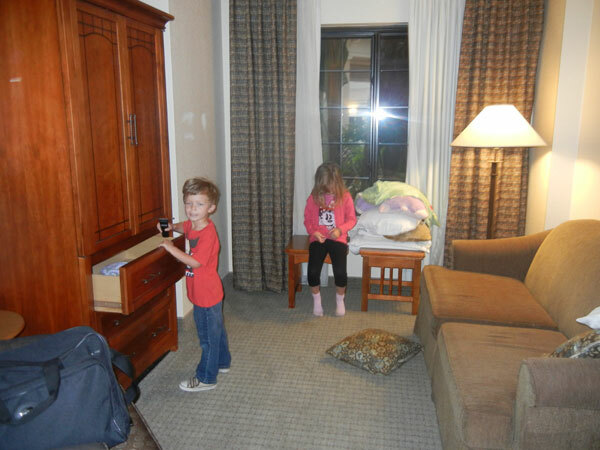 The kids were extremely excited about staying in a hotel. Can you spot the kids' bed in this photo? In the morning we met with Nick and Alisha at breakfast downstairs. 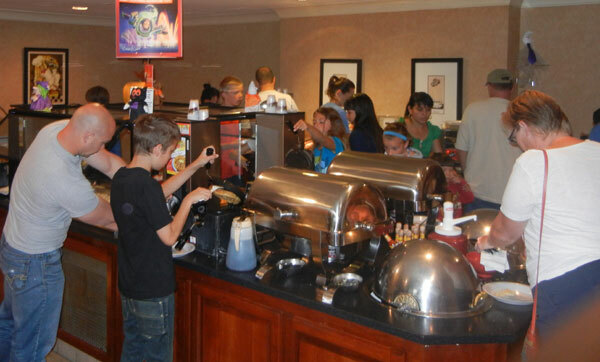 The hotel breakfast was eggs, waffles, bagels and canned peaches, juice and and coffee, with a rotating selection of sausage, bacon and ham. An included hotel breakfast buffet takes on a special significance when your next meal is going to cost $45 inside Disneyland. 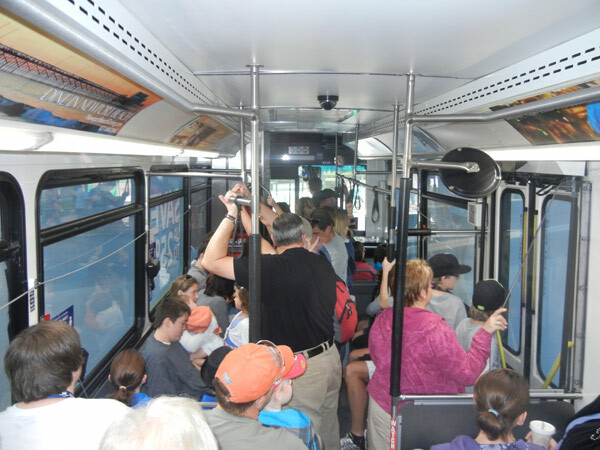 The hotel didn't have a dedicated hotel shuttle to Disneyland, but they were on the route for a subset of buses routes dedicated to Disneyland and the Anahiem convention center. It was just as good, with two extra stops on the way to the park. We bought three day shuttle bus passes for $10 each, and we were on our way. We jumped off the shuttle a few minutes later, standing in a wide plaza between the two parks: Disneyland and Disney's California Adventure. We didn't have "park hopper" tickets, so we had to choose just one park for the whole day. We chose Disneyland. 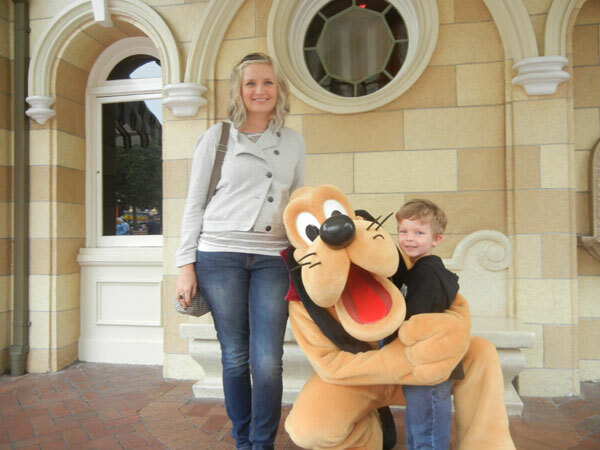 Six minutes later, my son was hugging Pluto. 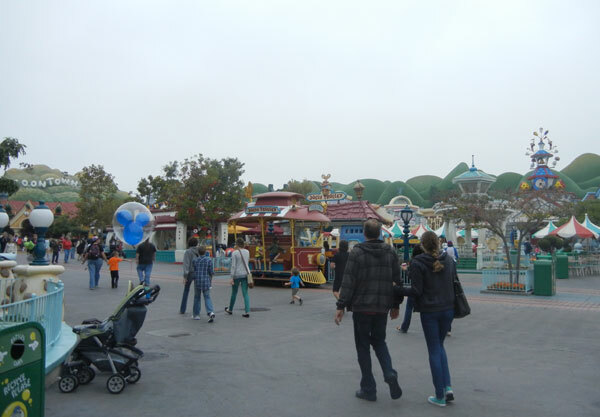 It was an overcast Thursday morning in October, so the park was lightly attended. Alisha and Stacy stopped to grab a cappuccino ($4.30) on Main Street. 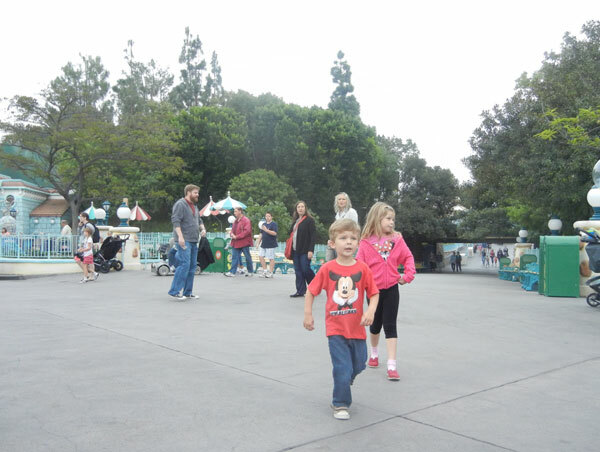 Next we introduced our kids to Sleeping Beauty's castle in the center of the park, and made our way through to Toontown. Our first legitmate ride was Roger Rabbit's Car Toon spin. This is a "dark ride" where each car can spin around 360 degrees like a teacup. We picked up Fastpass tickets to the Car Toon, and the line looked very short, so we stepped in. This was a mistake. The line was actually about 45 minutes long, it was just concealed completely within the structure of the ride. The ride was pretty good, but our kids weren't familiar with the Roger Rabbit movie, so we didn't plan on returning. Our Fastpasses would go unused. 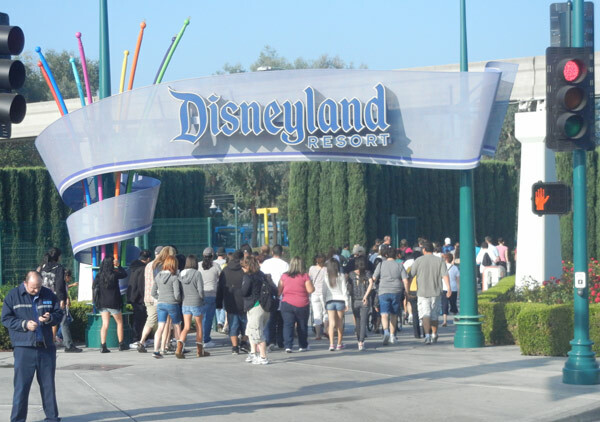 Disneyland is a one-entry fee park, good for all the attractions and rides. 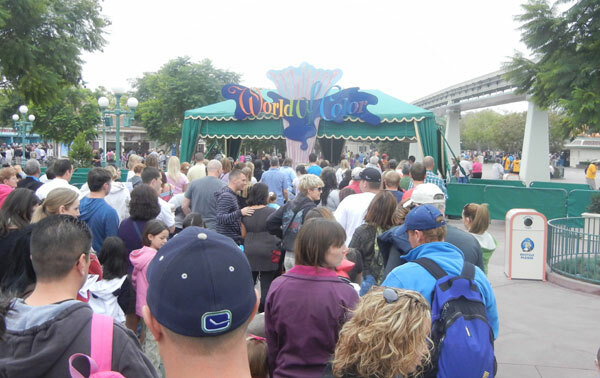 Twelve years ago, you had to just wait in line for rides, with the most popular rides sometimes taking 60 or 90 minutes of wait time. 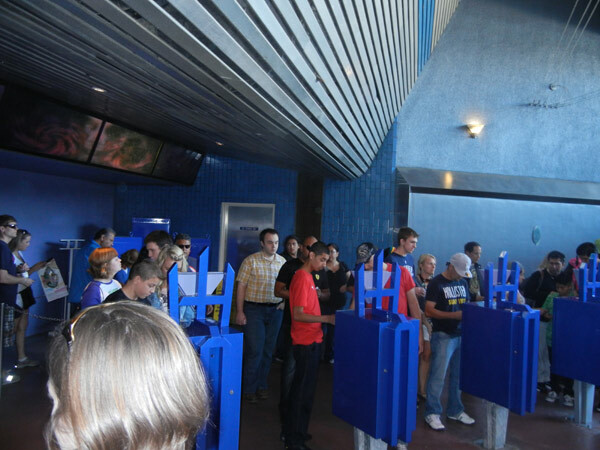 Fastpass is a virtual ride reservation system, controlled by small ticket dispensers outside of the eight busiest rides. The Fastpass ticket is printed with a ride time span for you, e.g. 10:20am - 11:20 am., usually at least an hour from the present time. It is a reservation to ride. When you arrive at a ride with a Fastpass reservation, you queue up in a second, super-short line, run past all the other people in the regular line and jump right onto the ride. Fastpasses are awesome. You can only hold one or two at a time, so you can't avoid lines all day, but the system definitely frees up several hours in each day when you might otherwise be standing in line, staring at your smartphone. We didn't spend any more time in Toon Town, we circled back to the "Disney Princess Fantasy Faire", which I believe was just a walkthrough attraction where you can meet and pose with a few of the Disney princess characters. We were scared off by the 90-minute posted wait. We made our way back down to Fantasyland, spotting Snow White, the Mad Hatter and Mary Poppins on the way. We also rand into Jafar and Malificent. We rode Snow White's Scary Adventure. Another dark ride. It was already 11:10 am. We made plans to come back to this area to hit the Storybook canal boats, Pinocchio's Daring Journey, etc., but we wanted to pick up some more Fastpasses first. 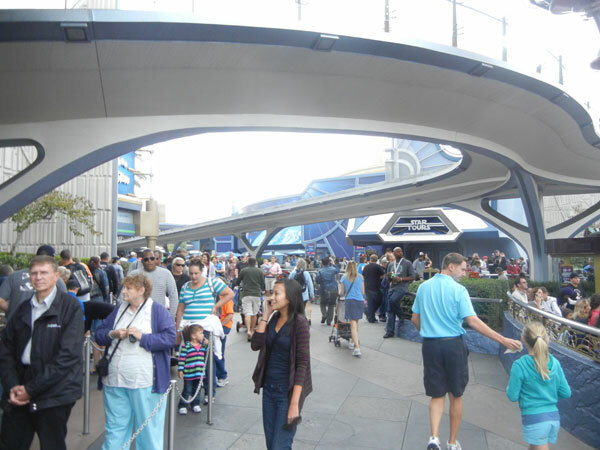 We headed to Tomorrowland, where we found the newest attraction, a revamped Star Tours ride. Unfortunately everyone was queued up already, and even the Fastpasses weren't going to be good until 7:30 that evening! We opted instead for Buzz Lightyear's Astro Blaster, another dark ride, this one had spinning cars and dual pistols with which to attack battery-hoarding baddies on the way. Each rider's target performance was calculated by a score on their dashboard. It was pretty fun!